The in-meeting chat allows you to send chat messages to other users within a meeting. You can send a private message to an individual user or you can send a message to an entire group. As the host, you can choose who the participants can chat with or to disable chat entirely. In-meeting chat can be saved manually or automatically. Auto-save chat will automatically save your in-meeting chat locally on your computer. You can also manually save your chat when you start local or cloud recording. While in a meeting, click Chat in the meeting controls. This will open the chat on the right. You can type a message into the chat box or click on the drop down next to To: if you want to send a message to a specific person. When new chat messages are sent to you or everyone, a preview of the message will appear and Chat will flash orange in your host controls. 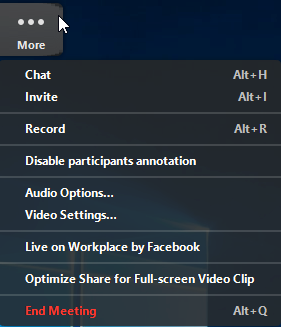 While screen sharing, click More in the meeting controls. Choose Chat. 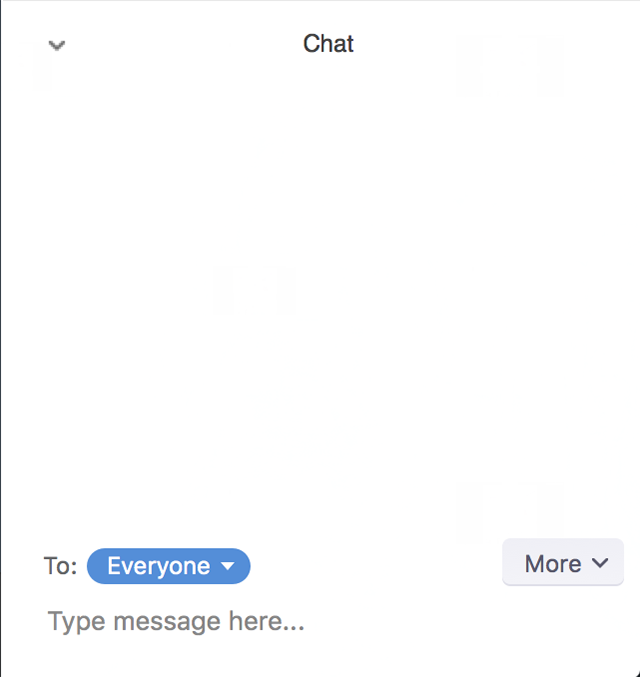 A floating chat window will appear. If you receive new chat messages while screen share, the more button will flash orange to indicate the incoming message. You can click on More, then Chat to open the window. While in a meeting, tap the screen to make the screen to make the controls appear. At the bottom of the participants list, click on Chat. You can type your chat message and click Send or if you want to change who it is being sent to, click the arrow next to Send to: and choose a different person or group of people. Incoming chats will be displayed at the bottom of your screen and you can click on Participants then Chat to view them. 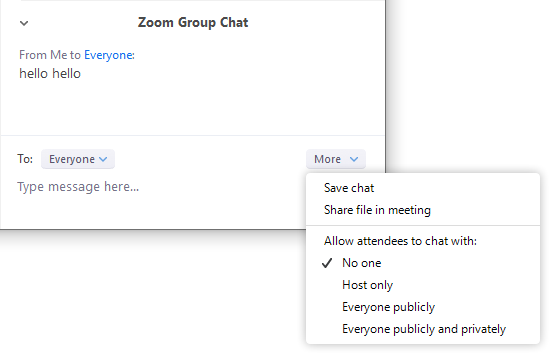 If you're the meeting host, you can change the in-meeting chat settings. Click More to display in-meeting chat settings. Save chat: Save all chat messages in a TXT file. Share file in meeting: Send a file in the chat. Allow attendees to chat with: Control who participants can chat with. No one: Disables in-meeting chat. Host only: Only the host can send messages to everyone. Participants can still send private messages to the host. Everyone publicly: Participants can only send public messages. Public messages are visible to all participants. Participants can still send private messages to the host. Everyone publicly and privately: Participants can send public or private messages. Public messages are visible to all participants. Private messages are sent to a specific participant.